New England has its tried and true attractions, but it's also a region that's never, ever boring. There are a surplus of unusual and cool things to do if you know where to look. Here are 10 things you didn't know you could do, from touching presidents' tombs to dining in an outhouse. Where? Mount Washington Cog Railway off Route 302, Bretton Woods, New Hampshire. When Sylvester Marsh first proposed a railroad line to the summit of Mount Washington—New England's highest peak—members of New Hampshire's state legislature told him he'd "might as well build a railway to the moon." 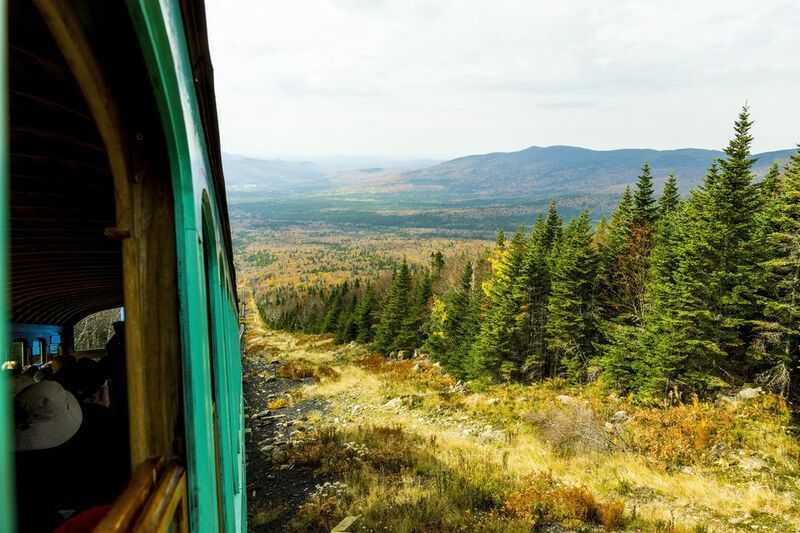 Undaunted—and motivated due to the harrowing experience of being lost near the summit—Marsh persisted, and in 1869, the Mount Washington Cog Railway became the world's first mountain-climbing train. More than 140 years later, this engineering feat is still a marvel and the most memorable way to reach the top of New England. Originally powered by wood, then coal, these trains now typically run on biodiesel (one steam-powered locomotive still makes the ascent each morning during peak season) as they make their steep, three-mile ascent. Trains run daily Memorial Day weekend through October and on a weekends-only schedule from late April through Memorial Day and during November. Where? Blithewold Mansion, Gardens and Arboretum at 101 Ferry Road in Bristol, Rhode Island. When you think, "Giant Sequoia," you probably think: "California." True: Sequoiadendron giganteum, the world's most massive tree, only grows naturally in California's Sierra Nevada mountain range. In 1911, however, John DeWolf, superintendent of New York City's Prospect Park, shipped a 12-foot-tall Giant Sequoia he'd been cultivating in a greenhouse up to Providence, Rhode Island, by train. From there, it journeyed to its new home at Blithewold, the coastal estate of William and Bessie McKee. As the estate's landscape architect, DeWolf had already begun transforming the property into an arboretum showcasing diverse tree species. He was careful to create an ideal environment for this addition, and the giant redwood is now more than a century old, and, at nearly 100 feet, it's the tallest Giant Sequoia east of the Rockies. There are a dozen other Sequoias at Blithewold, too: All but one are descendants of this towering tree, planted from cuttings or seeds. The grounds at Blithewold are open year-round from 10 a.m. until 5 p.m. Monday through Saturday and 10 a.m. until 3 p.m. on Sunday. Mansion tours are offered April through mid-October, Tuesday through Sunday. Where? Miya's Sushi at 68 Howe Street in New Haven, Connecticut. Many chefs have embraced the notion of using organic, local and sustainable ingredients in their cooking. But I've never met a chef who adheres to this philosophy with the same intensity as Bun Lai. Not only does this Asian American chef forage for edible plants, harvest his own seaweed and dive for oysters and clams cultivated in the 100 Long Island Sound acres of shellfishing grounds he owns, he's on a mission to rid the planet of invasive species. Asian Shore Crabs are an unfortunate import detested by Long Island Sound fishermen because they devour shellfish larvae. Chef Lai serves them deep-fried, shell and all, and eating a few of these crunchy, spiced intruders will make you feel like an environmental hero... as well as a gourmand. Miya's Sushi, the restaurant Lai's mother founded three decades ago, is open Tuesday through Sunday. You won't find tuna rolls (tuna is overfished! ), but you will find an intriguing regular menu in addition to the invasive species menu. Where? L.L.Bean Flagship Store at 95 Main Street in Freeport, Maine. Freeport, Maine, is the closest thing New England has to Manhattan. Here, there's one business that never sleeps: L.L. Bean. In fact, this iconic, century-old retailer is so serious about its commitment to being open around the clock, 365 days of the year, it removed the locks from its doors in 1951. Shopping in the wee hours isn't just for insomniacs! Celebrities have been known to be night owl browsers when they're less likely to attract attention. Where? United First Parish Church at 1306 Hancock Street in Quincy, Massachusetts. You may know that you can visit two presidential birthplaces in Quincy, Massachusetts: The National Park Service maintains the humble Colonial-era homes where the nation's second and sixth presidents were born within the Adams National Historical Park. Park visitors also tour the grander home John and Abigail Adams and their descendants occupied from 1788 until 1946. But outside the park's auspices, there's an even more fascinating presidential place. Adjacent to the Adams National Historical Park Visitor Center in downtown Quincy, United First Parish Church quietly offers access to the final resting place of John Adams and John Quincy Adams, as well as their wives, First Ladies Abigail Adams and Louisa Catherine Adams. Yes: You can venture down into the crypt and touch the tombs of two New Englanders who shaped our nation. Tours of the Church of the Presidents are available daily mid-April through mid-November. Where? Stoweflake Mountain Resort & Spa at 1746 Mountain Road in Stowe, Vermont. Why imbibe coffee when you can absorb it through your skin? That might be your first thought if you treat yourself to a Green Mountain Coffee Body Treatment, one of the signature offerings at the spa at Vermont's Stoweflake Resort. It's not surprising that coffee grounds make an excellent exfoliant, but who knew coffee has detoxifying and cellulite-fighting properties? Of course, this isn't just any coffee: It's Vermont's own Organic Fair Trade Green Mountain Coffee. The invigorating scrub is followed by an antioxidant Dead Sea Mud wrap, and the treatment concludes with a soothing coffee oil massage that will leave you smelling like your favorite a.m. beverage all day. With a menu of more than 120 distinctive treatments and a wonderful Aqua Solarium featuring vigorous hydrotherapy waterfalls and a Hungarian Mineral Soaking Pool, Stoweflake's spa is a wonderful destination for stress relief. Spa treatments may be reserved by both hotel guests and non-guests. Where? Country Mischief on the Common in Templeton, Massachusetts. Don't worry. You won't have to contend with flies or stench while you down Belgian waffles or a Pesto Cheddar Melt at the Mischievous Chef: the breakfast and lunch (and Sunday brunch) restaurant at Country Mischief, one of New England's most eclectic shopping destinations. You might have to contend with funny comments on your Facebook status update, though, if you share that you're dining in an outhouse. This 1770 brick building on the green in Templeton, Massachusetts, housed a boarding school in the 1820s, and what was once the boys' three-seat outhouse is now a cozy dining nook. There's a dining room with a fireplace and a cheerful outdoor porch, too, but if you can score the table where the students used to, um... you know... you'll have both a satisfying meal and a story to tell. The Mischievous Chef at Country Mischief serves breakfast from 8 until 11:30 a.m. and lunch from 11:30 a.m. until 3 p.m. Wednesday through Saturday. On Sunday, brunch is available from 8 a.m. to 3 p.m.
Where? SkyVenture at 3 Poisson Avenue in Nashua, New Hampshire. Too chicken to jump out of a plane? Luckily, there's a better way to fly like Wonder Woman here in New England. The vertical wind tunnel at SkyVenture in New Hampshire simulates the skydiving experience. It's used by professional skydivers for training, but it's also a unique adventure for less-than-intrepid folks who would never dream of making a jump. Kids as young as three can fly, and so can seniors, which makes this the perfect family bonding opportunity. SkyVenture is open daily, from 2 until 10 p.m. weekdays, from 10 a.m. until 10 p.m. on Saturdays and from 10 a.m. until 9 p.m. on Sundays. Where? Maine Windjammer Association with ships sailing from Rockland, Rockport and Camden, Maine. The eight tall sailing ships that make up the Maine Windjammer fleet offer memorable, multi-day adventures departing from three Midcoast Maine ports. While some were built in the 20th century, many of these vessels are floating museums. Five have been designated National Historic Landmarks including the two oldest, the Stephen Taber and the Lewis R. French: Both were built in 1871. Don't expect luxury: A Windjammer excursion is a bit like camping on the water. Sleeping quarters are cramped, conditions can be cool and damp, and you may find you miss electricity! While the amenities and conveniences offered on each ship vary, all offer the chance to vacation at a slower pace, to see the incomparable scenery and to feast! Windjammer cruises are known for their food, including, on most trips, an all-you-can-devour lobster bake on an island. The Beluga Contact Program at Connecticut's Mystic Aquarium is truly one of the most extraordinary things you can do in New England. Not only will you wade into the tank with one of these fascinating marine mammals, but you'll also have an intimate experience as you touch the whale, from its tail to its melon: the fatty organ at its forehead. Mystic Aquarium—home to one of the largest beluga exhibits in North America—is a leader in studying and conserving the species. The contact program will leave you not only with a remarkable tale to tell but with a sense of wonder and appreciation for these creatures. Mystic Aquarium offers its Beluga Contact Program May through October. Reservations should be made online or by calling.